YGO: 2012 Wave 2 Collecible Tins from Konami! 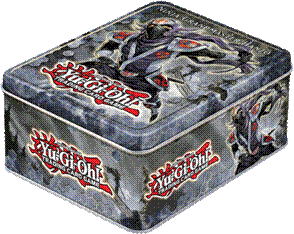 Konami Digital Entertainment Inc. is proud to bring you the next wave of Yu-Gi-Oh tins featuring our fall release. Each 2012 Yu‐Gi‐Oh! TRADING CARD GAME Holiday Tin will include 5 booster packs plus 5 additional foil cards. This 5+5 model was incredibly popular with fans in 2010 and 2011. 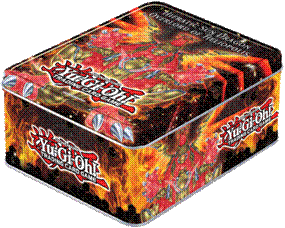 Each embossed tin will feature a powerful monster (also depicted on the tin's lid), plus 4 variant cards including high‐demand cards that are difficult to obtain. Perfect for the new player, or for the veteran looking to fill out his collection! New Card Game from Bonsai Entertainment! The Game of Accusations and Alibis Players take turns making Accusations against the other players by placing Method, Motive, or Opportunity cards in front of them; or providing Alibis against the Accusations made against them by other players. Ruse uses a specialized deck with themed suits and amazing artwork to tell the story of murder and mayhem under the gaslights of St. Sebastian. 2 - 4 Players use a specialized poker deck of playing cards with four steampunk inspired suits; Guns, Gears, Crystals, & Gaslamps, and amazing artwork which brings the Methods, Motives, Opportunities, and Alibis to life as you weave a story of how your opponents committed murder and you were clearly innocent. With a deviously delicious cast of characters, it is a delight to imagine navigating the gaslight streets of Saint Sebastian as you maneuver to convict an opponent of the murder at hand. Each Allies character will come in a two piece telescoping box containing a brand new 40-card character deck, Rules, Player Mat, Gold Coin Tokens, Fortitude and Alcohol Content markers as well as extra elements unique to each character. Zot’s turning in early for the night, but Pooky’s not done with the party. With a stash of gold and a big chip on his wee shoulder, this strange little rabbit-thing is looking to prove he’s more than just Zot’s whipping bunny. 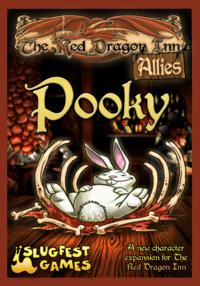 The Good: In the dungeon, Pooky’s psychotic behavior has gotten the party out of some pretty nasty jams. The Bad: That rabbit is even more insane without Zot’s influence… Seriously. Each Allies character will come in a two piece telescoping box containing a brand new 40-card character deck, Rules, Player Mat, Gold Coin Tokens, Fortitude and Alcohol Content markers as well as extra elements unique to each character. When you first meet this soft-spoken young elf, you might be surprised to learn that she’s an adept adventurer; even more so that she’s often fighting on the front line. 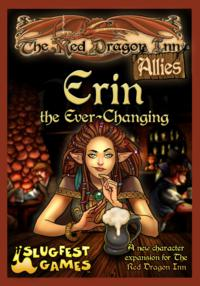 But then again, you don’t run into very many shape shifting druids at the Red Dragon Inn… The Good: Erin’s always ready with a kind word and a healing chant to smooth ruffled feathers or mend wounded flesh. The Bad: When the drinks start flowing, Erin can turn into a tree. Have you ever tried out-drinking a tree? It’s not pretty. 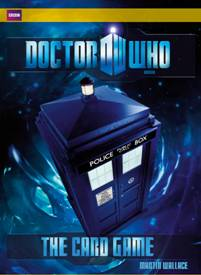 New Dr Who Card Game from Cubicle 7! Daleks, Cybermen, Sontarans – The list of threats is endless and no place in the universe is ever truly safe from danger, but there is one man who has made it his mission to defend the defenseless, help the helpless, and save everyone he can: a mysterious stranger, a force of nature who has seen his own planet die, a madman with a box. In Doctor Who: The Card Game, players act as the Doctor and his companions to defend specific locations while sending the Doctor's enemies to conquer locations your opponents are trying to protect. Each player starts the game with one location, and cards in the deck consist of attackers, defenders, locations and support cards. To start a turn, you draw two cards, pick up any cards banked from a previous turn, and take the three cards passed to you earlier by the player on your left. 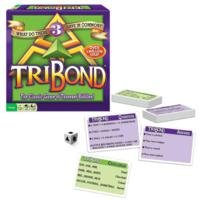 You play or bank cards until you have only three in hand, then pass those to the player on your right and end your turn. Attackers target specific locations and earn points for the player wielding them if they're in play at the end of the game. Defenders try to remove attackers so that the location owner scores points for protecting the location. Support cards provide different abilities, such as enlarging your bank or providing time points (which can be used to draw additional cards). Whoever has the most points at the end of the game wins! Avenger/Centurion/Hammersmith—Cygnar Heavy Warjack (plastic) Caspian engineers developed the hulking Centurion to rival the size and strength of Khador’s warjacks. 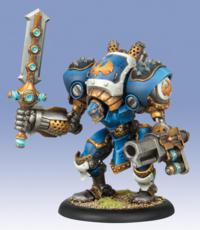 Its increased armor and heavy shield makes it one of Cygnar’s most durable designs, and its mighty piston spear can easily pierce the hulls of enemy warjacks. The Hammersmith swaps out shield and spear with massive twin forge hammers meant to flatten anything in its path, while the Avenger features a stun blade and a groundbreaking seismic cannon. Representing a step forward in Cygnaran technology, the seismic cannon fires sophisticated projectiles that can unleash a localized earthquake upon impact. This box set contains three color stat cards and one multi-part heavy warjack plastic model (PIP 31074). Included are all the components to assemble one of three heavy warjack variants: Avenger, Centurion, or Hammersmith. A player may field any number of these heavy warjacks in a Cygnar army. SPECIAL NOTE: PIP 31074 contains the same Mk II stat cards as PIP 31025 and PIP 31039. The model in this box represents the same figures as those PIPs in the game. However, the model in PIP 31074 is a new sculpt and therefore looks different from the models found in those PIPs. In addition, this model is plastic rather than metal. 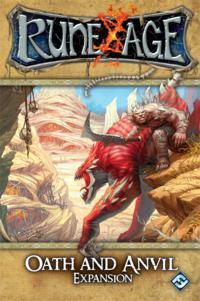 PIP 31025 and 31039 will no longer be available from Privateer Press beginning August 1, 2012. 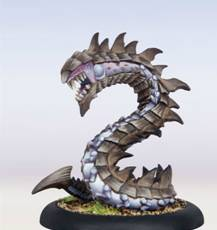 Kraken—Cryx Colossal (resin and white metal) The Kraken ranks among the most terrifying necromechanikal fabrications ever loosed upon the mortals of the Iron Kingdoms. With surprising agility for its size, a Kraken can quickly maneuver to take advantage of any situation on the battlefield. As it rises from the depths, its hellblaster cannon delivers devastating payloads supported by bursts from its flayer cannon to cut down infantry. The Kraken’s long tendrils erupt like steel serpents in the midst of formations, tearing apart warjacks and grasping victims to fuel its vile hunger. 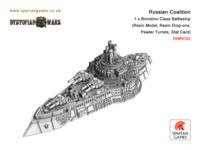 The Kraken colossal comes in a box (PIP 34050) and includes a colossal wreck marker. 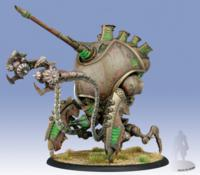 A player may field up to two Krakens for each warcaster in a Cryx army. 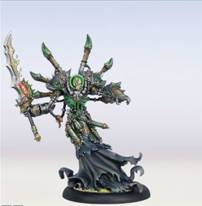 Asphyxious the Hellbringer & Vociferon—Cryx Epic Warcaster & Solo (white metal) More than one thousand years of preparation has brought Asphyxious closer than ever to his goal of rising above the other lich lords to stand as Toruk’s most invaluable general. He alone holds the key to unleashing the terrible might of the Nightmare Empire. To aid him in his great work, Asphyxious has applied his impressive mastery of thrall runes to craft Vociferon, a skarlock perfectly equipped to serve as a conduit for souls. Vociferon’s battle standard of death and discord resonates with unholy intent, for it was made to collect the essences of all who perish within its reach and fuel Asphyxious’ fell sorceries. The Asphyxious the Hellbringer epic warcaster & Vociferon solo come in a blister (PIP 34095). A player may field one Asphyxious the Hellbringer & Vociferon in a Cryx army. Scarsfell Griffon—Circle Light Warbeast (plastic) Griffons are predators that combine the sinewy grace of great hunting cats with the ferocity of birds of prey. Druids of the Circle Orboros have long tended griffon fledglings far from civilization and picked out those best suited to their needs. In the Scarsfell griffon they have found a hunter with a remarkable aptitude for stealth and ambush, one able to dive from great heights to surprise even well-camouflaged prey far below. The Scarsfell Griffon light warbeast comes in a box (PIP 72061). A player may field any number of Scarsfell Griffons in a Circle Orboros army. Cyclops Brute—Skorne Light Warbeast (plastic) The tenacious and vicious nature of the cyclops brutes makes them singularly responsive to training, and the skorne rely on them to hold the flanks of formations or stand vigil over tyrants. Armed with towering shields and massive polearms, brutes constitute a virtually insurmountable threat on the battlefield. Their unique vision focuses on evading blows, and they can extend this power to those they protect. The Cyclops Brute light warbeast comes in a box (PIP 74067). 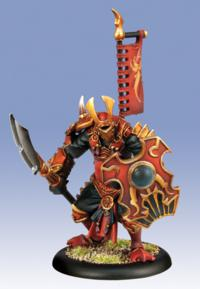 A player may field any number of Cyclops Brutes in a Skorne army. Gatorman Witch Doctor—Minion Gatorman Solo (white metal) Each witch doctor is a powerful mystic who lives and breathes the foul necromantic arts that are his birthright. Life and death are two edges of the same bloody knife to the witch doctor, who often sees his allies as nothing more than tools of battle to be moved between those two states as required. Amid the morass of combat he gathers the vile totems required to power his spells, tearing the fleshy trophies from the carcasses of vanquished foes. Raising his sacral blade aloft, the witch doctor utters sibilant incantations that impel the huge beasts he controls in a wave of scaled death. The Gatorman Witch Doctor solo comes in a blister (PIP 75040). 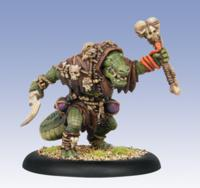 A player may field two Gatorman Witch Doctors for each warlock in a Minion Gatorman, Circle, Legion, Skorne, or Trollblood army. Heap is the madcap game of vehicular mayhem where the player who cobbles together the most outrageous vehicles wins! Each player plays a gang of crazed goblins that have traveled across the post-apocalyptic wasteland in broken-down vehicles to converge on a gigantic heap of long-discarded scrap—perfect ingredients for demented automotive modification. In arena-style bouts, each gang selects its champion driver to storm the heap and duke it out for the best parts to upgrade their vehicles. Be first to trick out your vehicles and dominate the final pileup to rule the heap! 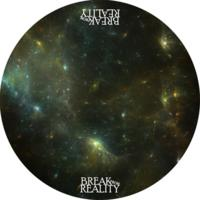 New from Break From Reality Games! 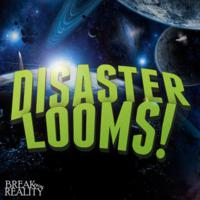 The Earth is probably doomed, and rumors and speculation run rampant. Newspaper headlines from across the globe stir the populace to desperation: "MELTING POLAR ICE CAPS" "RISING SEA LEVELS" "POLLUTION!" "OVERPOPULATION!" "NUCLEAR WINTER?" "RAVENOUS BLACK STAR GOATS?" "WILL METEORS STRIKE YOUR CHILDREN?" "DISASTER LOOMS!" This expansion includes: two additional player sets, new technologies, 21 new exploration tiles, and a set of CEOs and Corporations with unique advantages, disadvantages, and goals of their own. 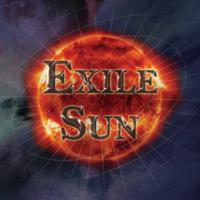 This is a full expansion for the game, and provides more than enough for the additional players - while also allowing greater flexibility and randomness in game play at smaller sizes as well. Double Sided Anti-Slip Mat! Printed on one side, black on the other - perfect for any tile laying game. Coming soon from Winning Moves! A super-sized 6x6 grid including the NEW double letter cube and NEW blank cube! 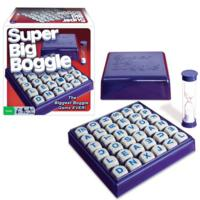 Thirty-six letter cubes and a 4-minutes timer provide a fresh challenge with every game! Additional Information Ages: 8 and up Players: 2 to 4 Contents: 36 letter cubes, stylish cube grid and dome, 4 minute sand timer and instructions. The fun starts with 3 seemingly unrelated clues. What do a Violinist, an Archer, and a Fancy Gift have in common? You win the card if your team guesses, "They all have bows!" Team with the most cards wins! Over 3 million sold! Additional Information Ages: 12 and up Players: 2 or more Contents: 400 cards with 2000 Threezer Riddles, card tray, die and instructions. 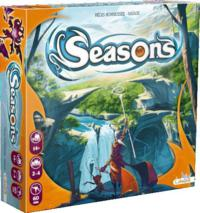 New Games and Expansions from Fantasy Flight Games! 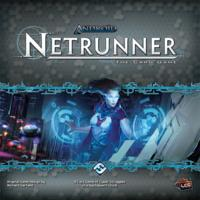 Richard Garfield’s classic cyberpunk card game returns cleaner, sharper, more flavorful, and better than ever with the release of Android Netrunner: The Card Game! This two-player Living Card Game™ of megacorps, runners, and cybercrime pits monolithic megacorps against subversive netrunners in a high-stakes struggle for valuable data. Humanity has spread its wings and taken trade to the far reaches of the solar system, having colonized the Moon and Mars. Visionary corporations created braintaping techniques that have led to the development of lifelike artificial intelligence. But as these massive corporations guard their intellectual property on the network behind layers of ice, netrunners seek to expose their secrets, for ideological reasons or for profit. 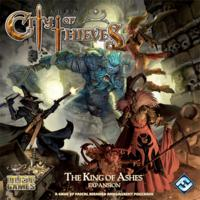 The guild intrigues of Cadwallon: City of Thieves grow even richer with the treasure trove of new adventures, characters, equipment, and Arcana in The King of Ashes Expansion! Rumors claim the newly-opened catacombs contain the legendary treasure of Sophet Drahas, and the thieves of the city above race to find entrance to these long-hidden catacombs and grab their riches. The King of Ashes explores these catacombs with a new board and six adventures that can play independently or combined into a larger campaign. But thieves delving into these underground passages need be wary, lest they run afoul the dread Cyclops of Mid-Nor! Revised rules make the militia a more imposing force, and rules for experience, equipment, and mercenaries afford tremendous strategic options in your games, especially when you play them as part of a larger campaign. Dungeon Fighter is a fully cooperative board game for one to six players that combines dexterity, adventure, and a healthy dose of humor. Players take on the roles of heroes venturing deep into a three-tier dungeon. Along their way, they explore the dungeon, search its many rooms, and face endless hordes of vicious monsters. 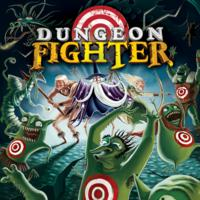 Where Dungeon Fighter stands apart is in its unique dexterity-based elements. Players take turns throwing dice at a colorful target board, often from several feet away! What’s more, randomly drawn dungeon effects may dictate that a player must throw his die behind his back, with his eyes closed, under his leg, or under any combination of (often hilarious) restrictions. Keep a steady hand a clear mind, and your team with emerge victorious! 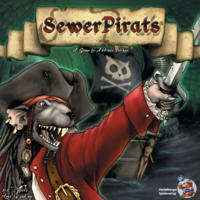 Command your crew to wealth and victory in Sewer Pirats, a whimsical treasure hunt for two to five players! Deep underground in a maze of domed caverns, narrow tunnels, and piped passages, a motley cast of rodents, insects, and other vermin sail the treacherous waters of human refuse aboard bizarre vessels in search of discarded booty. In order to claim the best haul from the abandoned flotsam, players must make careful use of the unique abilities of their crews’ rats, cockroaches, weasels, and other critters. The game comes to life with thirty detailed pirate figures, twenty Color-Click™ bases, and a rich assortment of game boards, tokens, and cards. Starter rules get you into the game quickly, and a Crew Member Auction variant increases the strategic depth and lighthearted action. While the dwarves of the Dunwarr Mountains labor tirelessly in their massive subterranean forges, the orcs of the Broken Plains are themselves tempered by tribal conflict in a hostile land. But can they set aside their ancient rivalries to work together in the face of an all new evil? Enhance every aspect of Rune Age with the Oath and Anvil Expansion! While the existing factions are bolstered by new units and abilities, two new empires join the conflict: the Orcs of the Broken Plains and the Dwarves of Dunwarr. At the same time, new scenarios challenge your deck-building prowess and new Mercenary cards provide even more strategic options. Unite the tribes, fire the forges, and experience Rune Age like never before! Mage Wars by Arcane Wonders! Mage Wars pits powerful Mages against each other in deadly arena combat. Each Mage uses his own fully-customizable book of spells to achieve total victory over his opponent. Summon mighty creatures to do battle in your name; cast powerful spells to attack your foe and thwart his every plan and strategy; use hidden enchantments to turn the tables and rule the day; adorn yourself with mighty weapons, armor, and arcane artifacts – all of this and more awaits you in the arena of Mage Wars! Do you have what it takes to enter the arena and battle to the death with the most powerful Mages in the world? Mage Wars® combines the best elements of customizable card games and tactical miniatures games to create a unique, fast-paced, strategic fight to the finish! Augment your Mage’s spellbook with your favorite spells. 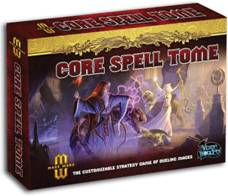 Customize your Mage with some of the best spells from the Core Set! Expand your enchantment library with spells like: Bear Strength, Divine Protection, Hawkeye, Marked for Death, and more! Build a massive army of creatures by adding more Bitterwood Foxes, Asyran Clerics, Skeletal Sentries, and Royal Archers to your spellbook. Always have the right card to play: whether that’s a Fireball or a Dispel, your Mage has plenty of options! 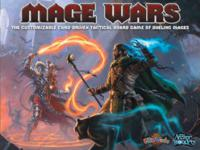 Mage Wars® Core Set requiredfor play. Bristling with turrets and broadsides, the Borodino Class Battleship is a truly fearsome vessel. Its ablative amour plating forms a hulking tiered formation that gives this ship an intimidating profile. With the ability absorb withering hails of fire; this industrial nightmare will forever haunt the ambitions of anyone who dares cross the path of the Russian Coalition. 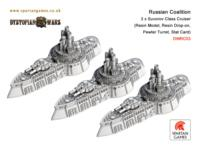 Russian Coalition Commanders use the Suvorov Class Cruiser as a harsh, unbending anvil against which their foes are crushed. Armed and armored like their battleship counterpart, they use their increased speed to hold the flanks, funneling the enemy into the core of the battle-line with the threat of their formidable turrets. A testament to the exceptional prowess of Russian Coalition engineers, the Myshkin Class Bomber presents a highly unique attack. A final bombing run will culminate in the detachment of the aircraft's heavily reinforced nose from the main body of the craft. The sturdy metal shell will then plummet from amid the clouds to crash through the enemy's decks, causing incalculable devastation. Russian Coalition Tiny Flyer Tokens are swept-back biplanes that feature oversized engine compartments and an overly-large fuselage. 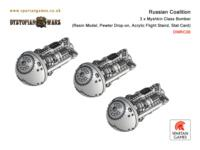 As such, they stand true to the Russian's status as an industrial powerhouse, and are a menacing addition to the skies above the battlefield. 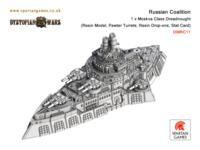 The Moskva Class Dreadnought is a mammoth machine that boasts almost unfathomable strength, ensuring the Russian Coalition are able to expand their influence even further afield. The strategy of this daunting ship is simple - use its powerful, forward facing weaponry, shrugging off what pitiful resistance its opponent can muster, and forcing the for to flee before its uncompromising might. One of the most exciting aspects of fielding the Russian Coalition is the multitude of unorthodox tactics that you can employ. Perhaps the most fascinating weapon at your disposal is the Vorkuta Class Land Driller. This ironclad machine is a key addition to the White Army, able to penetrate your foe's defenses and leave them trembling with fear. 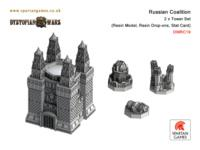 The grandeur of the Russian Coalition and the scale of its influence is epitomized in its mighty Tower Set. Monstrous, unforgiving guns will obliterate anyone foolish enough to believe they have a chance of toppling it. Whether utilizing the communications, shield or gun tower drop, this bastion of war is sure to be pivotal to the success of your campaign. The Belgorod Class Land Ship forms the majority of the Shock Armies' heaviest engines. Running on massed banks of wheels, the Belgorod is a veritable rolling fortress, able to cover all possible angles of attack. Designed for aggressive operations, it is capable of wading into the midst of enemy armored formations and then blasting away at targets on every bearing. Firestorm Armada Campaign Guide 1: Marauders of the Rift Marauders, pirates, raiders, corsairs, call them what you will, this full color Firestorm Armada Campaign Guide delivers to you page-after-page of thrilling information to take your space combat games to a new level. Six new factions are introduced, including the audacious Oroshan Imperium, along with statistics for numerous space vehicles, mercenary fleets, new in-game mechanics, a full campaign background and tabletop scenarios for you to game. 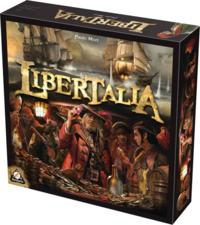 New Nautical Strategy Game from Gryphon Games! Outwit the plans of competing pirates over three campaigns while using the same crew cards as your comrades! Will you be able to make the most of the abilities of your characters at the right time, or will you have the loot snatched from under your foot by a wilier pirate than you? Dive in and prove your knack for tactics! The game takes place over three campaigns where players try to amass riches by looting ships. Looting is a dangerous activity, as players need to avoid collecting cursed relics. At the end of the game, the richest player is deemed the winner! The box contains: 1 game board; 6 pirate dens; 6 score tokens; 6 crew tokens; 180 character cards (30 for each player); 1 score track; 50 booty tiles [4 chests, 6 jewelry, 10 goods, 6 Spanish Officers, 6 sabers, 8 treasure maps, 10 cursed relics]; 13 doubloons of value 10; 10 doubloons of value 5; 45 doubloons of value 1, rules. Assuming the role of one of the greatest sorcerers of the time, you will be participating in the legendary tournament of the 12 Seasons. Your goal is to raise the most victory points by gathering energy, summoning familiars and magic items. If you amass enough crystals and symbols of prestige, you will become the kingdom's most illustrious mage. Optimize the cards through skilful combinations, using the seasons wisely to access the energies of crystals and become the new Archmage of the kingdom of Xidit. In a first phase, select 9 power cards at the same time as your opponents. Do the right choices, because they will determine the rest of the game. Acclimatize to the season to make the most of the actions proposed by each roll of the dice! Collect energies, invoke magical and familiar objects, and collect enough crystals, symbols of prestige. The time is now magician! The box contains: 1 game board; 1 year counter and 1 season wheel; 8 Library tokens; 8 special Sorcerer capacity cards; 16 sorcerer tokens; 4 individual game boards; 20 seasons dice or 4 different colors; 1 crystal track; 60 energy tokens – 15 of air, water, fire, and earth element; 100 power cards (numbered from 1 to 30); and 40 extended power cards (numbered 31 to 50). Werewolves celebrate 10 years of success! To celebrate this anniversary, “Lui-même” editions and the authors of Philippe des Pallières and Hervé Marly have concocted a special limited edition of this mythical game. For those who are new to the game, the goal is for the Werewolves to devour the townspeople at night and to conceal their identity during the day. However, the Werewolves need to take care as there are 11 special characters who have special talents that are determined to unmask them with the help of the villagers! The game includes 29 sturdy cardboard cards - including a “scapegoat” card to give players somebody to blame all mishaps on. 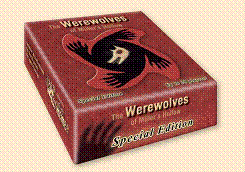 This Special Edition includes high quality game cards, a refreshed design, five of the characters from Werewolves New Moon and new illustrations. And a neat Sheriff’s Badge with a black cord to tie around the neck of the proudly elected official! 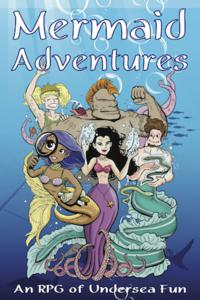 New Mermaid Adventure RPG from Third Eye Games! Dive into adventure and fun! Mermaid Adventures is a game that lets you and your friends become mermaids, forming friendships, fighting sea monsters and solving strange undersea mysteries. 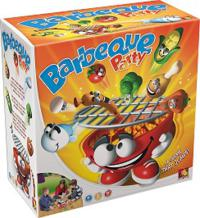 Great for families and players of all ages! Uncover a murder most foul by revealing six story elements that together describe the deadly deed and spell the word MURDER. But take care that your opponents can't do the same -- take their letters, counter their actions, or call on a waiting Crow to influence the murder before they do! At any moment a well-played card can shift the balance and seal someone's fate. 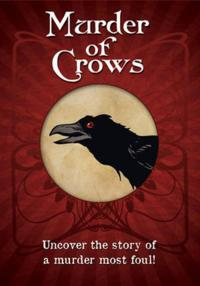 Murder of Crows is a fast-paced card game for 2 to 5 players that's quick to learn and features atmospheric art by Thomas Denmark. A game typically lasts 15 to 20 minutes, and is designed for ages 13 and up. 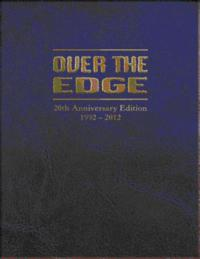 Over the Edge 20th Anniversary Edition This limited printing of the enhanced Over the Edge 2nd Edition core book celebrates the 20th anniversary of Over the Edge, the seminal roleplaying game of surreal danger that changed the way RPGs are played. • Limited Edition: The printing is of only a few hundred of this collector's item. The books are individually numbered, and signed by game designer Jonathan Tweet. • Deluxe Binding: Featuring a dark blue leatherette hardcover with gold foil stamped logo and high-quality smythe sewn binding. • Premium Interior: A NEW 16-page full-color section introduces the book, while the interior is a reprint of the B&W 2nd Edition on premium coated paper stock. In 1976, as the specter of nuclear war loomed worldwide, the UN Security Council introduced Resolution 501. Known as the Table-Tennis Accords, it decreed that all conflict between nations be resolved through the dialect of Ping-Pong. When Chinese terrorists struck down the US Table Tennis Team in 1979, a rag-tag band of students was forced to play in their stead. Lead by rivals Johnathan Gabriel and Tycho Brahe, they were victorious – but not unharmed. Now, in 1984, the Russian Bear has begun to stir. In times like these, America needs men whose grip is sure. Men who play the entire table. Rumble in the House is a very simple bluffing and guessing game for the whole family. The twelve characters start in the house. Each player receives two secret character tokens. In turn, players will move one of the characters inside the house, or pick a victim and eliminate it from the game. The player who keeps his secret characters the longest in the house shall win the round. During play, the other player's moves provide clues to their identity, unless of course they bluffed by moving other characters on purpose... Everyone tries to identify and expel the other player's characters while keeping their own safe. Game Contents: A twelve pages multilingual rulebook (French, English, Spanish, Dutch and German - two pages per language), Twelve double sided cardboard room tiles ,Twelve character stand-ups, Twelve stand-up plastic feet, Twelve 'Secret Character' tokens, Twelve plastic stackable counters to keep track of score and player color, One cardboard score track. 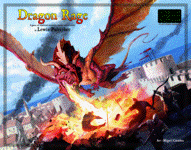 Dragon Rage is an introductory wargame set in a fantasy world. Dragons and other monsters attack walled cities, trying to destroy as much of the city building as they can while the city garrison fights back. Controls the invading monsters or the city forces in a merciless struggle! The basic game scenario has two Dragons attacking the seaside city of Esirien. The defender controls a small militia that defends the city. All troops are represented by counters on the game board's hex grid. During each game turn, each player may move some or all his units and then fight the enemies within attack range. The humans have a local hero which has special powers, as well as a wizard that can cast spells. The dragons are very resilient and can breathe fire, destructing men and buildings in a blazing roar. Combat is resolved trough a dice roll on a combat resolution table, cross-referencing the attacking and defending unit's strength. Dragon Rage is a good introduction to the world of wargames : There are few units on both sides, making the game simple to learn and fast-paced. 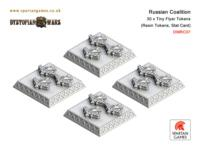 It will introduce you to key wargaming concepts such as tactical movement on an hexagon grid, units statistics printed on the counters, use of a combat resolution table, attack-to-defense ratios, terrain modifiers, reinforcements, and special abilities. New Books from Osprey Publishing! New HackMaster Players Handbook from Kenzer + Co! New Mythic Battles Game from Iello! New Board Game from Privateer Press! New Marvel Heroes from Margaret Weis! 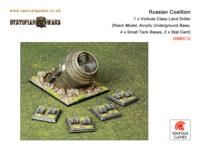 New Starter Packs from MERCS Miniatures! New from Atomic Overmind Press! New Card Game from Tech Lab Games! New Tsuro from Calliope Games! 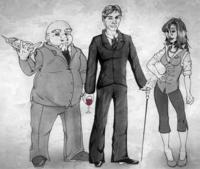 New Steampunk RPG from Cracked Monocle! New BeyWheelz and Battleship Kreo from Hasbro! 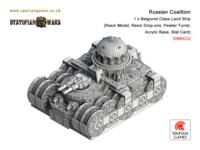 New Models from Ares Games! Coming Soon from Amarillo Design Bureau! New D&D From Wizards of the Coast! Ghost Pirates from Brooklyn Indie Games! New Pokemon, Now with Dragons!